Are you using safe, NON-TOXIC, CHEMICAL-FREE cleaning and personal products in your home? Young Living’s THIEVES home cleaning and personal products line offers a clean, non-toxic option  replacing harsh chemicals with 100% pure, therapeutic-grade essential oils and other naturally derived ingredients! If you’re interested in finding an alternative to harsh bleach and chemical-filled cleaning products, then come by TCA in March for a casual introduction to some new products and learn more - just in time for spring cleaning your home! Join Dr. Michelle Woods on Wednesday Dec 12th, for a fun holiday event! Come listen to oils expert Laticia Headings briefly talk about Young Living essential oils. 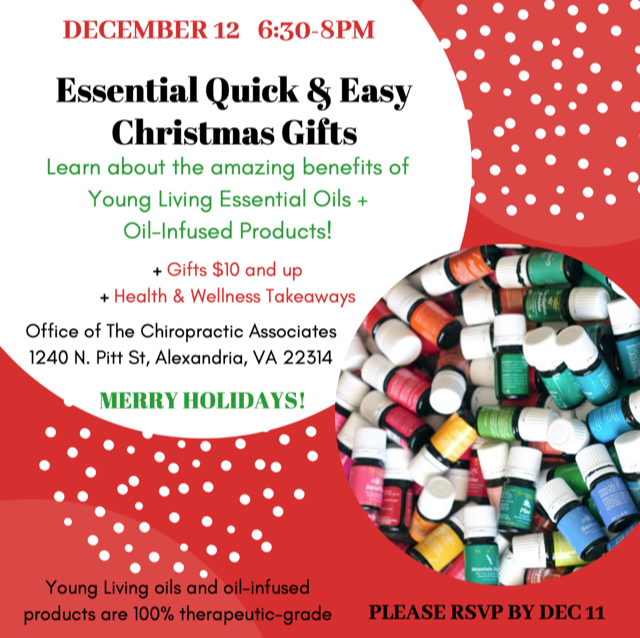 learn some benefits of using and diffusing oils, browse some holiday gifts from $10 and up, and enjoy holiday refreshments! For the month of September, Dr. Michelle is focusing some extra attention on the shoulder and offering a courtesy consultation and exam to see if Neuromuscular Reeducation (NMR) is right for you. NMR is a hands-on technique/approach to the evaluation and functional treatment of soft tissue injuries of the body.If you suffer from a shoulder issue, or know someone who does, set up an appointment for a complimentary consultation with Dr. Michelle at the front desk and mention this offer! From a chiropractic perspective healing is aboutremoving interference to the flow of natural life energy so the body can heal itself. Chiropractors find these blockages and release the natural healing power of the body. Dr. Taylor has treated many people for the symptoms associated with spring allergies. Join DR.NANCY TAYLOR to explore this unique paradigm in the context of improving your natural vitality and addressing typical issues resulting in spring allergies. PLEASE BRING A FRIEND ALONG AND CALL US AT 703-739-0456 OR EMAIL US AT DRSEANNOVA@GMAIL.COM TO RSVP. HOW TO STAY HEALTHY IN THE 21ST CENTURY! Join Dr. Sean as he covers the important steps one needs to take to ensure their body can properly handle and eliminate the myriad of toxins that are in the environment and foods we come across on a daily basis. · you get irritable, shaky, or a headache if a meal is delayed or skipped. Space is limited, please sign up to reserve your spot! Will your current health habits help you in the long run? Learn ways to prevent age-related stresses on your body in this free informational talk with Dr. Sean Woods. Learn about high blood pressure and what you can do through nutrition, stress reduction techniques, and chiropractic to reduce it naturally! Free, educational talk. Feel free to bring guests.